Many consider the trip by train from Denver to Glenwood Springs, Colorado, to be the most beautiful stretch of track in the lower 48 states. I could not argue with them. You catch the California Zephyr at the historic Union Station in downtown Denver and travel in comfort for 150 miles through Colorado’s glorious back country. As we boarded the train, I nabbed a large, cushy window seat on the left side of the train. I knew from a previous ride that most of the steep canyon views on the first half of the trip would be right below me and for the last 30 minutes, through Glenwood Canyon, I would want to be in the Vista Dome. I had my sketchbook and my favorite pen ready to record the entire ride. We pulled slowly out of the station and headed west out of Denver. As with most train trips, our first panorama was the city’s industrial area, but soon we were traveling through old neighborhoods filled with homes and the daily living of the locals. Gaining altitude as soon as we left the city, the view filled with fields of wheat and hay. The sun was shining, but I do not think the weather would have mattered at all. These were my childhood stomping grounds and I wanted to capture it all. The train bed sloped gently toward the foothills of the Rocky Mountains leaving the fields behind. The Flat Irons near Boulder jutted up, smooth slabs of rock that have invited vigorous climbers from around the world, and suddenly, we were in the mountains. The Rocky Mountains are relatively young mountains. Formed by sedimentation, uplift, water erosion, and glacial movement, they have not weathered long enough to be smoothly contoured like the Appalachians and are not as young as the Himalayas with their thin-air peaks. They are rugged and tall, built of limestone, sandstone, shale, and granite. 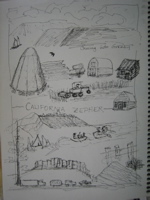 They are filled with the romance of the high country, the old west, and gold. Even in the foothills, the lure of Colorado’s gold rush can be seen in log cabins, old mining equipment, and golden piles of tailings high on the mountain sides. 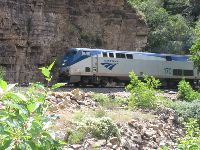 For nearly half of the trip from Denver to Glenwood Springs, the train veers north from the route of Interstate 70, one of the main east-west arterials in the US. This is a true back country experience, even for those with no interest in hoofing it on their own. The narrow tracks cling to the sides of steep canyons, with only inches to spare on either side. If my window opened, I would either be able to touch pine boughs and rock outcrops with my hand or look straight to the bottom of canyons. 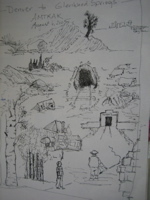 Higher, we began entering narrow tunnels carved into the rock heart of the mountains. Dug mostly by hand, it appears to me that they are so narrow as to have miniscule clearance between tunnel and train. In 30 minutes we went through 28 tunnels that tame the steep grades taking us to the western slope of the Rockies. At regular intervals, the conductor uses the intercom to offer passengers travel notes about the geology and history of the stretch of track they are seeing. Taking a train through the Rocky Mountains must have seemed impossible in the 1800’s. Rails were laid in 1887, that connected Grand Junction, on the western slope of the Rockies, with Denver. The trains went over high passes, up to 11,000 feet above sea level, and were often held up by snow in the winter. Snow sheds were built where the trains could be sheltered during storms. They were large enough to shelter three trains which would often be stranded for up to a week before being able to continue their trips. One train was stranded for a record 26 days! David H. Moffit, with interests in banking, mining, and railroads, suggested a tunnel through the mountains that would cut off the highest and most treacherous passes. There was little financial interest in the project until he proposed using the tunnel to bring needed water to the Denver area via the tunnel. In 1927, the Moffit Tunnel was opened. It cut the five hour trip over the passes to 12 minutes, is 6.3 miles long, avoids the worst snows, and was paid for with water revenues. Up through Boulder Creek Canyon there was little evidence of the modern world. Cottonwood puffs floated on the warm air and aspen leaves danced in the breeze. The pines were green, the spruce and sage were blue, the mullin was yellow, the fireweed was lavender. Unfortunately, brown was also painted across the mountainsides, evidence that a beetle is killing off large numbers of pine trees. Our path took us through Winter Park, Frasier, and Granby, Colorado, each an alpine village. If Frasier sounds familiar, it is often noted on the evening weather report as the coldest spot in the United States! From there we began following the course of Green River and then the Colorado River. Water always follows the path of least resistance which is why train and road beds often follow rivers. From Granby, the real back country began. The Route of the California Zephyr offers the traveler views that are, for the most part, inaccessible to car travel. High mountain peaks, deep canyons, and pristine meadows, are the reward. I spotted a few narrow, dirt roads, but here nature has remained essentially unchanged during our 200 years of stewardship. After about 100 miles of breathtaking vistas, the real fun begins. The conductor assures you that all passengers will get a turn in the Vista Dome Car. Unknowing passengers, rush to take their turns in the beginning of the trip. I, on the other hand, know what is coming and wander on down when we have only about 20 miles to go. A seat is waiting for me. The vista dome car was envisioned by Cyrus Osborn in 1944, during a stay in Glenwood Springs. This lovely community is located at the western end of Glenwood Canyon. Along with the train, a thread of dirt road and then a paved two lane “highway”, snaked through the rocky canyon. At the bottom of the cliffs and with the canyon so narrow, travelers could only see rock formations that were near the bottom of the near-vertical sandstone walls. Cyrus, thinking it was a shame that passengers could not see the upper limits of the canyon, designed a train car with massive windows that curved up the sides and onto the roof of the compartment. In comfortable seats, the passengers can look to the top of the cliffs. And, they are magnificent. The sandstone’s color pallette ranges from reds and oranges to golds and browns with purples and greens thrown in for good measure. The chunks of sedimentary rock are piled on each other, much the way a child would put wooden blocks back into their original box. Except, the canyon has no box! Just rocks piled on rocks. Before the Colorado River found this path of least resistance, the land was a high, flattop mesa called the White River Plateau. As the river cut its channel, the exposed rock pile became unstable. Aided by tree roots and the freeze/thaw cycle in this mile-high climate, the rocks toppled to the ever deepening canyon floor. Young, only 5 million years old, Glenwood Canyon is a work in progress. Once, while walking along the old highway which is part of the canyon’s trail system, we heard a falling rock. Looking up, we could not spot the piece of geologic history in the rugged landscape. Still looking up, we reminded each other to be ready to move! “Ah,” we thought when we spotted it, “only a pebble.” That pebble turned out to be the size of a very large grapefruit and I still count us lucky to have escaped its destiny. Train travel has an allure all its own and the California Zephyr does not disappoint. Occasionally, we could hear the iron wheels squeal on the tracks as we negotiated tight turns and the whistle blew as we passed back country train crossings. But, the train is not the only way to enjoy Glenwood Canyon. The 16 mile stretch of Interstate 70 that goes through the canyon is considered the most beautiful and most expensive ($30 million per mile) in the United States. Widened, in the last 25 years to a four lane freeway, you might expect that cars and trucks invade the canyon. With innovative planning and construction, the canyon has retained its magnificence. 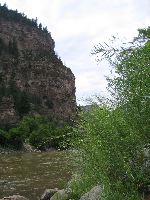 Tunnels, rest areas, viaducts, and a recreational trail let you enter Glenwood Canyon as a participant. The conductor slowed to a respectful five to ten miles per hour for the last 16 miles to the Glenwood Train Station. From the time we entered the canyon, the Vista Dome was silent except for the ooh’s and aah’s of appreciative travelers who were enjoying one of the most beautiful spots on Earth. 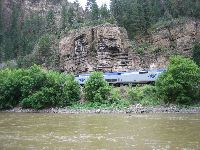 The California Zephyr travels from Chicago to San Francisco. From Denver To Glenwood Springs the fare is $51,00.